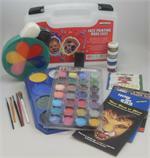 This plastic portfolio case has all you need to get into face painting. It has the 8 most popular 18ml paints (white, black, red, yellow, blue, orange, green, pink) as well as the 28 color companion with the next 28 most popular colors in the 2ml/.14oz size. It also has five 56 page step-by-step how-to books, one of the 8 color petal sponges and the five most popular professional brushes. It also has the .7 ounce loose glitter in silver and gold.